The ADB is playing an increasingly important – and destructive – role in Laos, promoting industrial tree plantations at the expense of community forests, swiddens, grazing land and commons. By Chris Lang. Published in Watershed, July – October 2003. Through its projects and policy advice the Asian Development Bank is setting the economic and legal framework for the expansion of tree plantations and the pulp and paper industry in the Mekong Region. In Lao PDR the ADB is playing an increasingly important – and destructive – role. Chris Lang describes the Bank’s involvement in the forests in Laos and in particular how the ADB is promoting industrial tree plantations at the expense of village people’s community forests, swiddens, grazing land and commons. 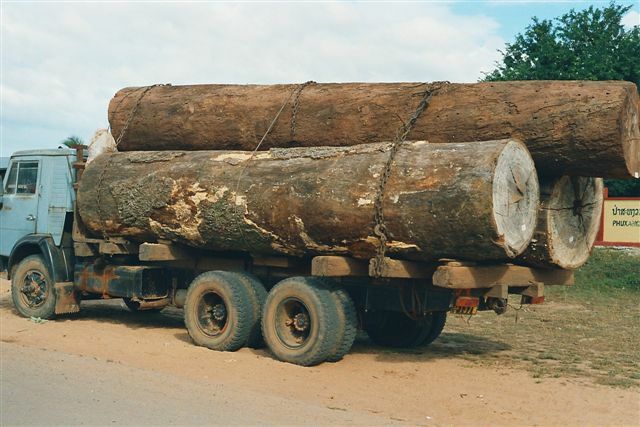 The ADB’s first forest projects in Laos supported the logging industry. In the 1990s, as the forests of Laos continued to disappear, largely as a result of the logging industry, the Bank has turned its attention to supporting industrial tree plantations and the pulp and paper industry. The Asian Development Bank’s involvement in the forests of Lao PDR started in 1978 with a US$8 million loan for a “Forestry Development Project”. Since then the Bank’s lending for forestry projects in Laos has shown a consistent bias in favour of industry over communities. The Bank’s rhetoric may have changed towards poverty alleviation and rural development, but the bias in favour of industry remains. The ADB’s first projects supported the development of the logging and timber industry and more recently, as the forests of Laos have become increasingly logged out, the Bank has turned its attention to industrial tree plantations for the pulp and paper industry. The ADB’s 1978 “Forestry Development Project” loan went on rehabilitating wood-processing operations, including modernising a plywood mill and logging operations which would “ensure a regular flow of raw material to the processing facilities”, according to ADB documents. The ADB’s bias towards industrial forestry is reinforced by the forestry consultants hired to provide advice and to carry out Bank projects. For example, part of the Forestry Development Project was to have involved collecting seed from forests to use for future replanting. ADB consultant Saravanamuttu Muttiah reported, however, that it was simply too much hard work to get into the forests to collect seed. “Because of various difficulties encountered in getting into remote forest areas for seed collection, the possibility of establishing chiefly clonal seed orchards of premier species was examined but it requires considerable initial research support,” wrote Muttiah. Foresters are often happier working in the laboratory or seedling nursery with tree species they know about, than working in forests collecting seeds from trees about which they know far less than local communities. Muttiah added, “Eucalypts have a difinite [sic] place for community forestry in Laos.” By the end of the project, 150 hectares, mainly of Eucalyptus camaldulensis, had been planted. The Bank described this as a “measure of success” of the project’s reforestation component. The Bank did not discuss the fact that communities receive a series of benefits from their community forests which are simply not available from eucalyptus plantations. The ADB’s Forestry Development Project was planned to be completed in March 1980. After the early delays to the project, it was reformulated in 1981. By 1986, when the project was finally completed, the total cost had exceeded predictions by almost 40 per cent. Although the project made a profit, the Bank reported that was a result of “the lucrative nature of the industry” and the ADB’s Project Performance Audit Report rated the project only “partially successful”. A 1994 ADB report, “Sector Synthesis of Post Evaluation Findings in the Forestry Sector”, which includes a description of the project, makes no mention of the impact on either the forests or the people of Laos. Despite the serious problems that the ADB ran into with its first forestry project in Laos, even before this first project was completed the Bank had started its next foray into the forests of Laos. In December 1984, the ADB approved a second loan of US$8 million for a “Second Forestry Development Project”. Once again, the focus was on industrial forestry. The project was aimed at supporting state forestry enterprises (including Lao Plymill, Rattan Furniture Factory, Parquet Factory and State Forest Enterprise No. 9) with the aim of “expanding the forest industry, reducing industry production costs and improving forest resource utilization,” according to the Bank. The loan became effective in July 1985, but the project was put on hold for three years, while the Lao govern ment restructured the Lao Wood Industry Corporation, which was to be the Executing Agency for the project. The ADB’s next involvement in the Lao forestry sector came with its funding of a Tropical Forestry Action Plan (TFAP) for Laos. Other funding for the Lao TFAP came from the United Nations Development Programme, United Nations Food and Agriculture Organisation, the World Bank and the Swedish International Development Agency. Once again, the ADB was involved in promoting industrial forestry. Published in 1990, the TFAP report recommended that that Laos should log its forests at the rate of 275,000 cubic metres a year. “Commercially valuable” forest was to be logged – an area as large as one million hectares according to the TFAP consultants. The TFAP consultants’ second priority was the introduction of industrial tree plantations on logged over and degraded forest land to feed the pulp and paper industry in Thailand and other countries in Southeast Asia. Sure enough, soon after the TFAP for Laos was completed, an ADB-funded study looked at establishing plantations of fast-growing trees for production of industrial wood for export. This study was carried out as a response to recommendations in the TFAP, according to Bounphom Mounda of the Lao Department of Forestry. In December 1993, following this study, the ADB Board agreed a US$11.2 million loan to the Lao government for an “Industrial Tree Plantation Project”. The project started in July 1994 and the first phase is planned to finish in 2003. The project aimed to plant 9,600 hectares with commercial fast-growing tree plantations, with 7,000 hectares of this area to be established by private companies. By September 2000, the ADB reported that 7,842 hectares of tree plantations had been established under the project. 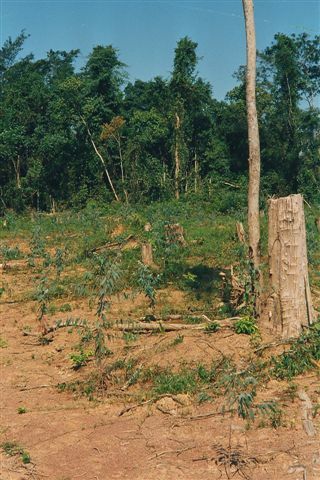 This area of forest was cleared in November 2000 to make way for BGA’s plantations near Ban Lao Kha. BGA is funded through the ADB’s industrial plantations project. 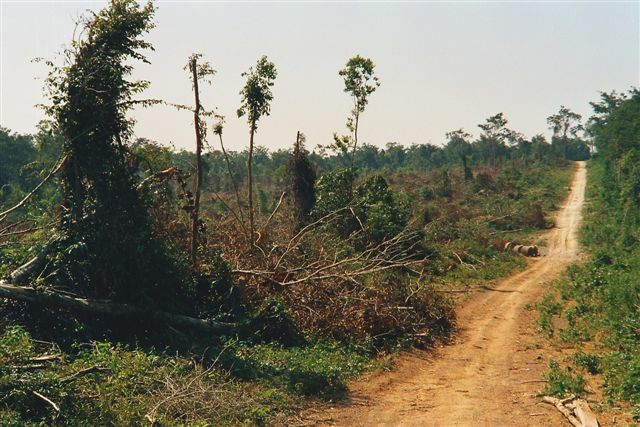 According to the ADB “plantations are all being established on degraded land – not on natural forest areas”. The ADB’s project involved a series of loans, with a series of repayment terms and interest rates. First, the ADB lent money to the Lao Government. The Bank gave the government 40 years to repay the loan. For the first 10 years the loan was interest free, after this period interest is to be charged at a rate of one per cent. The Lao government in turn lent money to the Agriculture Promotion Bank and gave the Bank 15 years to repay. For the first six years the loan was interest free, followed by a two per cent interest rate. The Agriculture Promotion Bank then lent money to companies or to farmers. Companies have 12 years to repay with six years interest-free, followed by a seven per cent interest rate. Companies had to provide 30 per cent of the money required themselves, before the loan could be approved. Farmers have to repay their loans within eight years with no interest-free period. For the first six years they have to pay 60 per cent of seven per cent annual interest and in the seventh and eighth years the entire loan plus interest must be repaid. Stumps of trees from forest cleared to make way for ADB-funded eucalyptus plantations. Further evidence that the ADB is lying when it claims that plantations are not established on forest areas. Farmers, whose poverty the ADB claims to be alleviating, get the worst deal. They pay more interest, have to repay the loan sooner, and they take on the risk that the price of wood might fall. If they are growing trees on their land instead of food crops, they risk having food shortages and no money to buy rice to feed their families. Meanwhile they get no income from the trees until they are cut down, at least five years after planting. The reality is that the ADB is funding the replacement of village people’s community forests, swidden fields, grazing land and commons with monoculture eucalyptus plantations. In 2001, independent researchers reported that at Ban Nao Neua, in Xaibouli district, 100 hectares of dry dipterocarp forest was destroyed to make way for ADB funded eucalyptus plantations. Instead of addressing village people’s concerns about the plantations, however, the ADB’s consultants attempted to convince village people that the plantations would not cause any problems and that a further 100 hectares should be planted. To foresters and the ADB’s “experts”, dry dipterocarp forest has less value than eucalyptus planta tions, but to villagers dry dipterocarp forest is very valuable, for example for mushroom collection or as grazing land for village livestock. Village people in Ban Nao Neua have not allowed any more eucalyptus to be planted on their common land. It would wrong however, to claim that no one benefits from the ADB’s support of plantations in Laos. A series of companies is benefiting from the Bank’s activities. The largest of these companies is BGA Lao Plantation Forestry Ltd (BGA). BGA was established as a US$30 million joint venture between Brierley Investments Limited (founded in New Zealand, but now registered in Bermuda with its head office in Singapore), General Finance (Thailand) and Asia Tech (Thailand). With the onset of the Thai financial crisis in mid-1997, General Finance and Asia Tech pulled out of the project leaving Brierley and the Lao Government as the only partners in BGA. The company has a 50 year land lease in Bolikhamxai and Khammouane provinces. BGA aims to establish between 44,000 and 53,000 hectares of mainly eucalyptus plantations. The company intends to build a wood chip mill in Hinboun and has future plans for a 1.1 million tonnes a year pulp mill. Wood chips and pulp are to be exported to Japan, via the Vietnamese port of Vinh. 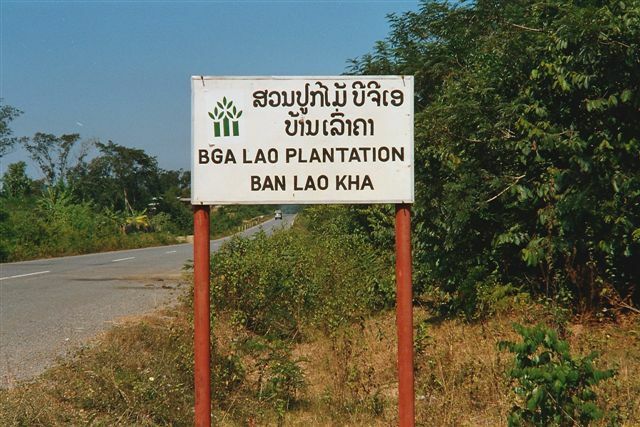 BGA is one of the companies benefitting from the ADB’s support of plantations in Laos. 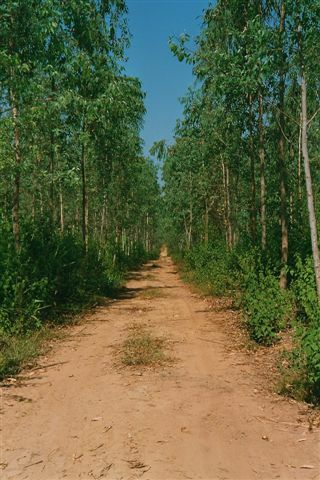 The company aims to plant around 50,000 hectares of mainly eucalyptus plantations in Bolikhamxai and Khammouane provinces. In 2000,70 percent of BGA’s activities were funded through the ADB’s plantations project. The company has also received generous subsidies from the Lao Government. The government handed over the land for the plantations rent-free in return for a five per cent share in the project. The government later bought a further 10 per cent share in the scheme. Under Lao Forestry Law plantations are exempt from land tax, and BGA pays only five per cent income tax on its operations. When BGA completes its wood chip factory, electricity will come from the nearby 210 megawatts Theun Hinboun dam, another ADB-funded project. Since 1998, when it was completed, the dam has caused serious problems for villagers who have seen the fisheries in the river destroyed along with their livelihoods. Route 8, which is critical to export the woodchips from BGA’s proposed wood chip mill, was rehabilitated with funding from the Japanese and Swedish governments. Before the rehabilitation, Route 8 had been almost completely destroyed by logging trucks. BGA does provide some employment. The company employs village people on a day-by-day basis as labourers for less than US$1 a day. Village people in Ban Lao Luang report that they welcome the money they have earned from working for BGA, and they no longer have to travel to Thailand to find paid work. However, while plantations require labour in the early stages – to clear the land, for example – once the land is cleared and the trees planted, the company will employ few people until the trees are cut down five years later. In Ban Lao Kha and Ban Lao Luang, BGA has cleared areas of dense natural forest in order to plant eucalyptus trees. Village people in Ban Lao Luang report that they have to walk further to collect mushrooms and other forest products, and wildlife such as mice and birds have moved to remaining forest areas away from the plantations. BGA sprays its plantations three times a year with the herbicide glyphosate. As a result nothing grows between the rows of eucalyptus trees. BGA sprays its plantations with herbicide three times a year. The herbicide ensures that nothing grows in BGA’s plantations other than eucalyptus trees. Village people’s knowledge and uses of the wide range of plants that grow in the forest are being destroyed as their forests are converted to monoculture. Throughout the country, Lao government officials are carrying out a land and forest allocation programme. In the areas where BGA is establishing its plantations, the government has allowed the company, in effect, to allocate itself the land it wants. The company has used aerial photographs, satellite images, maps and geographic positioning systems to locate the best land for plantations. Company documents describe between 39,000 and 48,000 hectares of the land leased to BGA as “shifting cultivation / grazing land / degraded forest”. In other words, this is land that village people are already using. Once again, Édes’ is attempting to mislead. Village people do not have the power or sufficient information about the impacts of eucalyptus plantations to bargain with plantation companies. Several consulting firms have benefited from contracts on the ADB’s plantation project, including Jaakko Pöyry (Finland), Burapha Development Consultants (Sweden-Laos), Fortech (Australia), CIRAD-Foret (France) and MIDAS Agronomics (Thailand). In the eight year project period the consultants produced project documents including an inception report, quarterly progress reports, plantation management papers, and environmental technical reports. Instead of providing independent advice to the Lao Government and the ADB, however, several of the consultants hired by the ADB appear to have conflicts of interest. Companies from the Jaakko Pöyry Group were hired by both ADB and by BGA. Pöyry carried out the feasibility study for BGA plantation, wood chip and pulp mill project. In 1995 Pöyry and Burapha produced a report for the ADB commenting on the Lao Government’s law on plantations, Directive 186. Among the consultant’s recommendations were that export taxes and transport taxes should be reduced. Another 1995 Pöyry report produced for the project states that the aim of the ADB’s project is to “develop a model to implement the policy of growing high yielding tree plantations on unstocked forest land and eroded land by the private sector.” The same report defines “unstocked forest” as “previously forested areas in which the crown density has been reduced to less than 20% because of logging or heavy disturbance” and “abandoned ‘hai’ [swidden fields] and disturbed stands with a crown density of less than 20%.” While this definition might make sense from the perspective of a forester trained in the scientific forestry tradition, it has little in common with the way villagers in Laos look at their forests. What appears to Jaakko Pöyry’s consultants as “unstocked forest” might be rich forest for mushroom collecting, grazing land or regenerating swidden to village people. Pöyry’s definition has allowed companies to describe village people’s community forests, grazing lands, fallow land, regenerating forest areas and fields as “unstocked forest” which they can then convert to fastgrowing tree plantations – precisely what Pöyry’s other client, BGA, has done. Ecosecurities, a firm hired by the ADB to look at whether ADB-funded plantations in Laos are eligible under the Clean Development Mechanism of the Kyoto Protocol, specialises in setting up carbon-trading deals for companies and governments. In October 2003, the Board of the ADB will decide whether to fund phase 2 of the Bank’s plantation project. Phase 2 is to be called “Tree Plantations for Livelihood Improvement”. The project aims to plant a further 10,000 hectares. According to the ADB’s project description, the new project “will build on the successes and lessons learned from the ongoing Industrial Tree Plantation Project.” However, the Bank has declined to disclose what it believes to be the successes or lessons learned from its previous project. A consortium of consultants is currently preparing the project. The consortium consists of two companies that have previously won contracts with the ADB’s Industrial Tree Plantations Project: MIDAS Agronomics and CIRADForet. Two other companies form the remainder of the consortium: SSC Natura (Sweden) and Champa Lao Consulting (Laos). IUCN and WWF declined to answer requests for confirmation of their support for ADB-funded plantations in Laos. ADB staff have declined to release the minutes from its workshops for phase 2 of its plantations project in Laos. The Bank has also declined to release copies of the presentations made during these workshops. The ADB has refused to release key project documents. The recommendations in these reports would require changes to the forestry law and could affect thousands of village people’s livelihoods. Yet the documents are not publicly available. The Bank’s preparations for its proposed project reflect the secrecy surrounding phase 1 of its plantations project in Laos. The Bank has refused to issue key studies associated with the project. These documents are important not only in the context of the ADB’s plantations project but because they are suggesting changes to Lao forest law and could therefore potentially affect tens of thousands of people’s livelihoods. 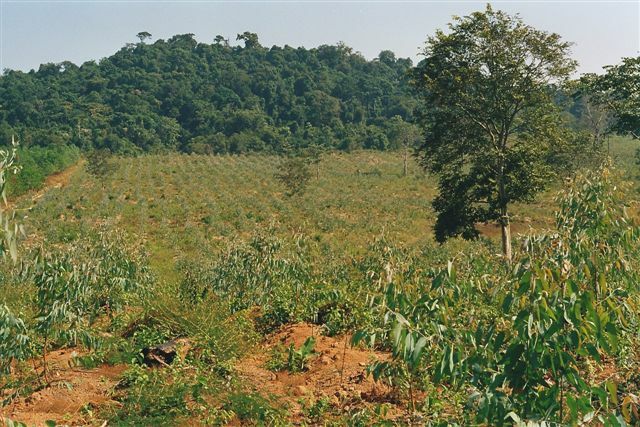 For example, in 1999, ADB commissioned Australian forestry consulting firm Fortech to produce a report enti tled “Current Constraints Affecting State and Private Investments in Industrial Tree Plantations in the Lao PDR.” In the Executive Summary of the report Fortech claims that plantation development in Laos “provides opportunities to generate economic growth and development” and recommends that the Lao government should approve “at least one large scale plantation project” by the end of January 1999. Without such a project, “international investors will decide not to proceed in Lao PDR”, according to Fortech. The report also recommends the Lao government should provide a series of measures to make it easier for international investors to invest in plantations in Laos. These include: rewriting the Plantation Regulations under the Forestry Law; appointing a “plantation investment coordinator”; preparing guidelines for plantation assessment proposals and a step-by-step guide for investors; collecting and publishing market information on domestic and international forest product markets; and building new roads in “key plantation development regions”. Fortech’s recommendations have major implications for people in Laos. Changes to the Forestry Law should be a matter for public discussion. Local communities in what Fortech calls “key plantation development regions” have a right to know what ADB-funded consultants are recommending for their land, forests and livelihoods. Similarly they have a right to know that new roads are to be built near their villages to serve the interests of international investors. Six months later Sahni wrote to inform me that “this study was done on behalf of the Lao PDR Government, and we had sought their concurrence to release the report. We have not so far had a response from them, and will again send a reminder.” Since then, I have heard nothing more on the subject from either the ADB or the Lao government. Another document produced by consultants for the ADB is entitled “National Strategy for Sustainable Plantation Forestry”. The Bank has ignored my repeated requests for this document. The ADB has a policy on Confidentiality and Disclosure of Information, which came into effect on 1 January 1995. According to the Bank, this policy was “prompted by the realization that the Bank should provide the greatest possible degree of transparency and accountability”. The Bank also states that it “emphasizes a presumption in favor of disclosure where disclosure would not materially harm the interests of the Bank, its members, borrowers, and private sector clients”. However, the Bank has ignored my requests for a complete list of documents produced under phase 1 of its plantations project in Laos. Without a complete list of documents produced under a project, it is impossible for anyone to know whether the Bank is upholding its Policy on Information Disclosure. The Bank claims several objectives for the policy, including: encouraging debate; ensuring local participation in decision making; broadening understanding of the Bank’s role; facilitating coordination “with others interested in the common goal of development of the region”; and increasing the Bank’s accountability. ADB (no date) Loan No. 1295-LAO(SF): Industrial Tree Plantation Project. Manila: Asian Development Bank. ADB (1994) “Sector Synthesis of Post Evaluation Findings in the Forestry Sector”, Asian Development Bank, Post-Evaluation Office, August 1994. ADB (1995) The Bank’s Policy on Forestry, Manila: Asian Development Bank. Edes, B.W. (2002) “Back to Trees”, ADB Review, Vol. 34, No. 5, September – October 2002. Fortech (1999) “Current Constraints Affecting State and Private Investments in Industrial Tree Plantations in the Lao PDR”, Executive Summary. Manila: Asian Development Bank. Jaakko Pöyry (1995a) “Decree 186/PM”, Lao-ADB Plantation Forestry Project, Asian Development Bank Project Technical Assistance TA. No. 2028 – LAO. Jaakko Pöyry (1995b) “Institutional strengthening to the DOF Lao PDR. Socio-Technical Profiles (STP), Benefit Monitoring and Evaluation (BME) for Plantation Development in Lao PDR”, Working Paper no. 9, Lao-ADB Plantation Forestry Project, Asian Development Bank Project Technical Assistance T.A. No. 2028 – LAO. Saravanamuttu Muttiah (no date) “Lao-ADB Forestry Development Project (261 SF). Draft Final Report on Nursery and Reforestation Component”, Resources Development Consultants Limited, Sri Lanka. Xeme Samontry (1995) “The Lao-ADB Plantation Forestry Project”. In Food and Agriculture Organisation (1995) National Workshop on Strengthening Re-afforestation Programmes in Lao PDR”, Vientiane 19-21 June 1995.